The goal of the Pico-Watt ACR project (pW-ACR) is to develop an absolute cryogenic radiometer (ACR) able to calibrate 1 pW of optical power with less than 1% uncertainty. The new radiometer will be greater than 1,000 times more sensitive than our present ACRs yet have nearly the same response time. A number of design features enable this ACR performance, including: use of a more sensitive thermometer on the ACR receiver, a weaker heat link between ACR receiver and heat sink, and miniaturization of the radiometer. Receiver cavity and Kapton heat link for pW-ACR. An absolute cryogenic radiometer (ACR) is an electrical substitution instrument for calibrating optical power. A bolometer designed so that virtually all incident optical power is absorbed by the radiometer, an ACR allows for absolute calibration against electrical standards. The ACR receiver is maintained in a closed loop at constant temperature, using a receiver thermometer and heater. As optical power on the receiver is changed, the change in electrical power to the heater required to maintain constant temperature is monitored. In a well-made ACR the equivalence between the electrical and optical powers can be good to less than 0.01%. Schematic depicting the components of an ACR. Light entering the receiver tends to heat it, but power changes to the receiver are used to maintain the receiver at a constant temperature. A number of parameters affect the responsivity and noise of the ACR, and through careful design can be used to maximize sensitivity and limit measurement uncertainty. An ideal standard detector should measure all incident photons, so the receiver optical absorptivity should be maximized. Generally the receiver cavity is conical, so that photons hit the receiver walls multiple times before escape, and it is coated on the inside with highly absorbing black paint. The weaker the thermal link between receiver and heat sink, the greater the power-temperature gain (i.e. degrees K of temperature change per W of incident power) of the ACR and the lower its thermal noise. The greater the sensitivity of the receiver thermometer, the greater the temperature-output gain (i.e. V output per degrees K of temperature change) of the ACR. The ACRII series of radiometers are presently used for calibration activities within LBIR, and the pW-ACR will extend calibration capability to lower power levels. The table below presents a comparison of key physical and performance parameters of the ACRII and pW-ACR. Three principal design features allow the pW-ACR to achieve much higher sensitivity than the ACRII while maintaining similar response time. The first design feature is use of a much more sensitive thermometer to monitor receiver temperature. For the ACRII, the receiver thermometer is a commercial germanium resistance thermometer (GRT) with temperature sensitivity on the order of 100 µK. We have developed a novel transition edge sensor (TES) for use with the pW-ACR receiver, which depends upon the magnetic superconducting transition of a tin element. The figure below presents low frequency noise data from a prototype thermometer which provides sensitivity on the order of 10 nK. The second design feature is a very weak thermal link between receiver and heat sink, made from thin-walled Kapton tubing. 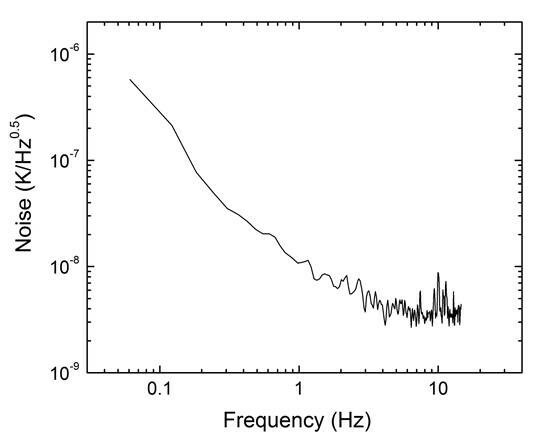 The thermal conductance of the thermal link for the pW-ACR is more than 20 times smaller than for the ACRII, leading to decreased thermal noise. The third design feature is miniaturization of the receiver cavity, which serves two primary purposes. First, the smaller cavity is light enough to allow the weak Kapton thermal link to act as its sole support. Second, the smaller pW-ACR cavity has significantly lower heat capacity than the ACRII, resulting in similar time constants for the two types of ACRs. The response time of an ACR is proportional to receiver heat capacity and inversely proportional to thermal link thermal conductance. For the pW-ACR compared to the ACRII, the weaker thermal link increases time constant, but the smaller heat capacity decreases time constant and compensates to leave time constant nearly unchanged. Low frequency temperature noise of a TES-type thermometer used to monitor temperature of the pW-ACR receiver. Prototype receiver cavity tested with absorptivity 0.9994 at 10.6 µm. Prototype receiver-cavity/thermal-link tested with G~5000 K/mW at 1.8 K.
Prototype Meissner-TES thermometer tested with sensitivity < 4 nK.